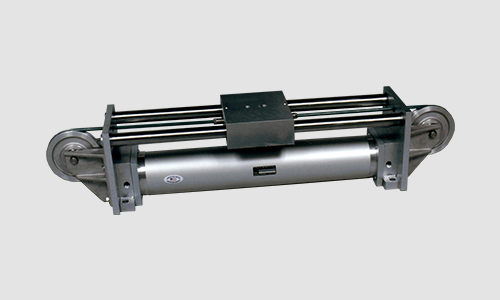 Trac-Trol ® is a guided cylinder with linear motion control and is ideal when an application requires a load bearing system to be self guided and self supported. As the piston is pushed in one direction, the load is pulled in the opposite direction within the length of the cylinder. Effective piston area is greater that conventional rod cylinders and there is equal force in both directions. Guided linear actuators, also called guided cable cylinders, can be configured to a variety of positions and ports along with a wide selection of accessories including Automatic Tensioners, Reed Switches, Shock Absorbers, Stainless Steel Guide Rods, Rulon Bearings and More. Trac-Trol® combines linear ball bearings in a trolley which runs on hardened and ground shafts. Air or hydraulic service for smooth operation and precise control. Nylon-covered, aircraft-type cable for extra long life. Optional low cost rod & cable wipers. Extremely small effective sealing area compared to band cylinders for longer working life and ideal for use in “dusty” applications. Greater bearing surface for larger capacities. Optional reed switch package available, click here for additional info. Aluminum hardcoated tubes standard or optional steel tube (special plating available). Pre-delivery testing and “break-in” to insure customer satisfaction.